I went back to school this month, working with the children and teachers at Fairlight Primary School and Brighton and Hove’s school dinner providers Autograph as we’ve piloted a project designed to fight the twin evils of food waste and unhealthy eating. The project involved providing the children with raw vegetables in colourful containers alongside their midday meal as an alternative to the usual cooked-veg option. We included carrot batons, mange tout, baby sweetcorn, broccoli florets and cucumber sticks among other veggie delights, presenting the children with a different choice of veg every day for the three weeks of the project. And we called the little containers Veg Power Pots. 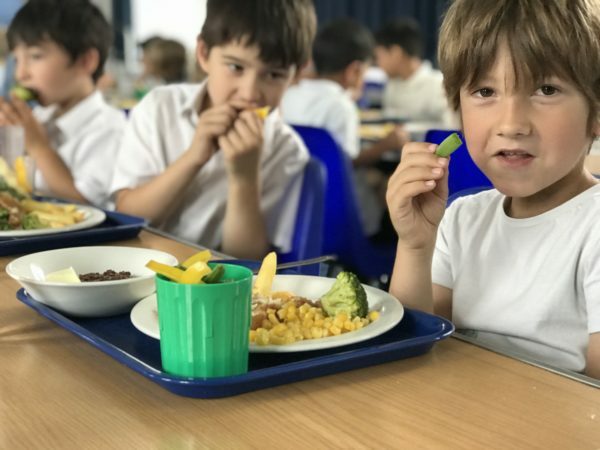 It was a simple idea to get the children to eat their veg – and one we came up with after we carried out a school waste audit last year which showed that the school cooked vegetables were the most wasted foodstuff from school dinners. Some of the raw vegetables went down better than others. Cabbage, it seems, is hard for many pupils to stomach even when presented in a Power Pot. But overall, it seems to have been a huge success. Now we need to evaluate how the project fared in cutting down the school’s food waste. Food waste is a major problem in Brighton and Hove, with 69,000 tonnes of food every year being thrown away by businesses and households. Combine this with the fact that 80% of younger children are not eating enough veg and there are really big issues for our city to take on. The Veg Power Pots are such a simple idea but they pack a mighty punch – making sure that children eat their vegetables with their school dinner. This should be a win:win in the fight to get children to eat their vegetables and tackle food waste. We worked on this project with Brighton and Hove City Council, which last year made a joint pledge with the Food Partnership to become a Veg City. This was part of the national campaign, established by the Food Foundation called Peas Please, encouraging everybody to eat more veg. If food waste is also shown to be reduced by the project, it is hoped that the Veg Power Pots initiative can be rolled out to other schools in the city.